Happy, bubbly, positive, energetic, kind, talented, and funny…those are words I would use to describe Hairstylist and Salon owner, K.K. I met K.K. at one of the boutique events at Wear It Out Manuel during Nashville Fashion Week. I was drawn to her easy-going, fun, personality and loved the way she styled the models’ hair for the Wine Wednesday event. K.K.’s passion for hair and fashion were evident at a very young age. She loved to go to her Aunt’s Salon and watch her work for hours. Her love of fashion and hairstyling blossomed into a desire to become a well-known fashion designer or hairstylist. In 2005, she decided to pursue her dream by working at Perfect Blend Salon in Nashville. Shortly thereafter, K.K. was invited by her cousin, who also happened to be a model, to accompany her on photo shoots as her personal hair and wardrobe stylist. Since this satisfied both of her passions, she was happy to oblige! The two worked successfully as a team doing photo shoots in Nashville and Atlanta for quite some time. Since then, K.K. has styled hair for magazines such as Hope Today and Concrete Magazine. She has also styled for numerous fashion shows such as Justine Sylvie, Nina D., Charles Lord, and Alain Patterson Couture. Most recently, K.K. was the chosen stylist for Nashville Fashion Week Boutique Events at Wear It Out Manuel www.wearitoutmanuel.com, Bullets n Mullets http://bulletsmullets.com, and Studio 615 http://www.studio615boutiques.com. In October of 2010, she opened Works of Art Salon where she has been steadily building her client base. Her main focus is on providing V.I.P. Services and giving her clients a one-of-a-kind experience. K.K. even offers in-home services for ultimate convenience for the woman on the go! I recently had the pleasure of visiting K.K. at her Salon and getting the V.I.P. Treatment for a special event. I was offered a glass of wine and treated to an incredible shampoo and scalp massage. K.K. really does know how to make her clients feel special. 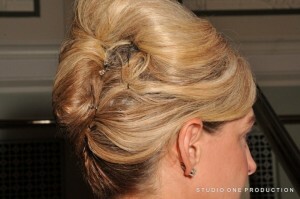 She created an amazing up-do for me that really blew me away! My Elegant French Twist by K.K. I was so impressed, I told all my friends about her and scheduled my next appointment. Sure, you can go ANYWHERE to get your hair done. But, if you want to be treated like a V.I.P. by one of the most talented, genuine people in Nashville, go see K.K.! To find out more about K.K. and her fabulous salon services, you can contact her via her website at www.worksofartsalonandspa.comor on Facebook www.facebook.com./artworks. My Fashion Maven (and K.K. would agree)…You don’t have to be a celebrity to look like one!